A friend dropped by the other day with a present. It was an unusual gift, but I thought it was pretty cool. 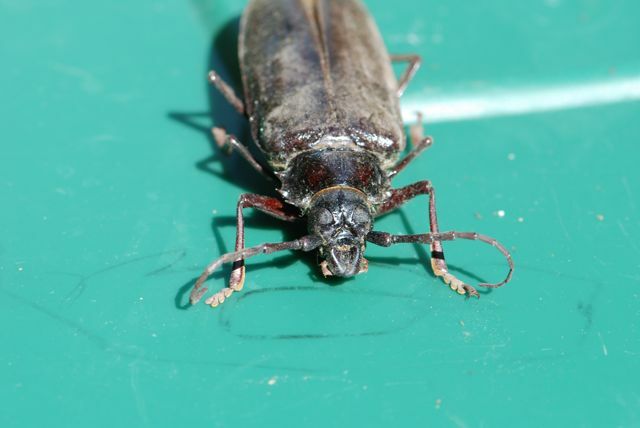 It was an adult palo verde borer beetle, Derobrachus hovorei, a little over three inches long. 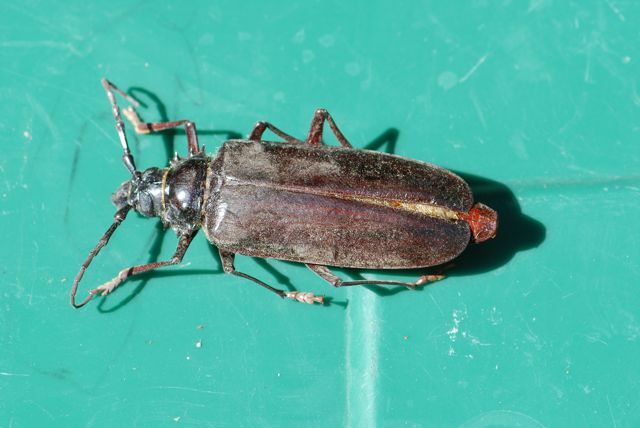 Palo verde borer beetles are common in late June and July in the Southwest. Although they look pretty fierce, they are really just big, clumsy dinosaurs (definitely the plant-eating kind). Adding to the fierce appearance is the "collar" of spines on the thorax. Where do they come from? Like cicadas, the immatures spend a long time under the ground feeding on tree roots. In this case, the beetle larvae are creamy white and may be a few inches long. The larvae pupate in the soil and when the adults emerge, they dig out of the soil. and Dragonfly Woman has an adult-friendly blog post about palo verde beetles.